Provide the additional support needed to lift long or large items with a fork truck. Self Dumping Hoppers automatically dumps when bumper release contacts side of dumpster. Convenient fork truck work platforms quickly and safely transport maintenance personnel where they are needed. Work platform attaches to fork truck by inserting forks into fork pockets and chaining platform to fork truck. Pallet Dumper Fork Truck Attachments. 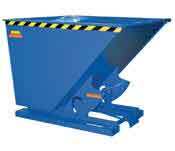 Dump loaded pallets - skids easily without leaving the seat of your fork lift with the all welded steel constructed Pallet Dumper. Unit fits to forks and is secured by a safety chain. Two retainers hold the pallet in place while dumping the contents into the hopper or dumpster. Unique performance, convenience and safety features are built into every Lift Boom. Fabricated from structural steel with welding to meet American Welding Society (AWS) creates a strong and sturdy lift boom that will provide long-term service. This product allows you to easily transport and rotate 55 gallons steel drums using a fork truck. Drums are held securely in place by a durable chain locking system. 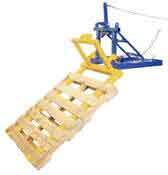 Each unit is provided with a 15 foot long chain to allow the drum to be rotated up to 360? from the fork truck operator's seat. Convert your fork truck into a swivel hook in a matter of seconds. The easy to attach Hoisting Hook does not require the assistance of special tools. Secured to the fork truck by means of a 36" long safety restraint and screw clamps. Available in single or double fork design. Units are zinc plated. Hook with shackle included. Snow Plow Blades are multifunctional to work with your existing fork Truck equipment. 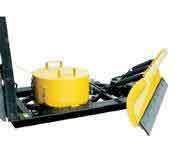 No more waiting for daytime snow removal, simply place the snow blade onto your fork truck and away you go. Prevent damage from obstacles and rough or uneven surfaces with trip springs. Easy angling and back-grade abilities allow you to go where your fork lift goes. Dock fork lift attachments are designed to help load and carry material from loading dock fork lift to truck effectively changes loading procedures and time. Easy Rack carries a wide variety of commercial shelving, material handling equipment, commercial lighting, used pallet racks, commercial christmas lighting and modular prefab buildings installed nationwide. If you can not find what you are looking for call us toll free at 1-888-776-3720 and we will find it for you. Our home office is located in Houston, Texas with regional distribution centers located in all 50 States including New York NY, Los Angeles CA, Miami, FL. Chicago, IL. Denver CO., Dallas TX, San Antonio, TX, Austin, TX, Boise ID, Atlanta GA, Albuquerque NM, Raleigh-Durham NC, Washington DC, Albuquerque NM, Huntsville AL, Fayetteville AR, Norfolk VA , Madison WI. Steel Security Folding Gates, Loading Dock Equipment, Drum Handling Equipment, Fork Truck Attachments, Gantry & Jib Cranes, Industrial Digital Floor Scales, Industrial Fans, Heaters & Blowers, Industrial ladders, Loading Dock Equipment, Miscellaneous Material Handling Equipment, Packaging Equipment, Pallet Trucks & Pallet Jacks, Scissor Lifts & Work Tables, Steel Dumping Hoppers, Utility Carts. Forklift Trash Can Dumper. Lift, carry, and dump trash cans without leaving the seat of your fork truck. Simple design does not have any moving parts. A heavy-duty forklift spreader bar is a forklift attachment bar that attaches to the front of a fork-truck. It is used to stabilize any material that has a tendency to bend when it is lifted. Forklift extensions are a type of forklift attachment that fit over the tines of a fork truck. These extenders enable forklift operators to handle exceptionally large loads, oddly shaped loads, and loads that are non-palleted. A lift hook, by definition, is an attachment with two fork pockets that slide onto the forks. Between this attachment there is a with a swivel hook positioned at 24”. Forklift attached work platforms are a simple to use alternative to other types of elevated working platforms that will enable staff to use the lifting potential of the fork lift truck to get them into a place where they can carry out inspection or maintenance work at a high level. Fork Lift Attachment. The majority of the forklift & fork truck attachments available are designed to refine rather than to reinvent the forktruck, and to make it a much more specialized tool that can perform jobs more accurately and more safely. Forklift Attachments & Fork Truck Extensions! There are a number of reasons why fork lift extensions and attachments are an essential tool for any environment where there is a range of items that need to me moved, such as in a large warehouse or storage facility.